Okay, I invited you to a party, so what’s all the excitement about? Well, first of all, everybody grab some refreshments. Get a piece of chocolate cake (after all what writer doesn’t like chocolate?) and grab some ice cream. Then brew yourself a cup of coffee just like you like it. We want everyone to be happy. Now for the big announcement. 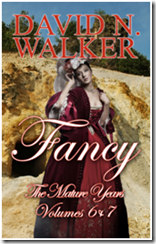 When I wrote Fancy, there were good reasons to make it a series of novellas instead of a single novel—primarily the changes in location and antagonists from one part of the story to the next. However, I’ve always felt like the pricing more or less forced on self-publishers made these books a little out of line. After all, each novella only has about half the words of a novel. As of today, the pricing problem is solved. I have combined volumes 1 & 2 into a single book, volumes 3 – 5 into another book, and volumes 6 & 7 into a third book. This allows me to cut prices considerably compared to the individual novellas. The paperback version of the novella series added up to $56.65. The new three-book set is only $38.77, a savings of $17.88 or 31.6%. The full e-book series on Amazon.com cost $20.65, while the new three-book series is only $10.97—a savings of $9.68 or 46.9%. On Smashwords, the seven-novella series cost $13.23, compared to $10.97 for the new three-book series—a savings of $2.26 or 17.1%. Any way you look at it, the new three-book series will save money for the reader, which makes me very happy. If you’ve started the series and want to continue with the individual novellas, you still can, or you can still buy the three books separately if you like. 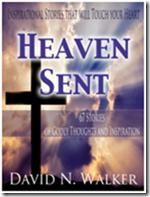 For the paperbacks, click here to go to CreateSpace. For the e-versions click here to go to Smashwords or here to go to Amazon.com. After you order your books, don’t forget to leave a comment below, and include a link either to a blog post you’ve written or to one of your books. Only one link per reader, though. If you post more than one link, I’ll have to send one of my friends after you in a virtual tank. The damage that would cause would be virtually horrible. Seriously, thanks for stopping by. 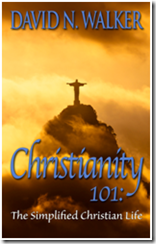 Enjoy your refreshments, order some books, and leave a comment. This entry was posted in Uncategorized and tagged Advice, Amazon.com, Authorship, Caring, CreateSpace, David N. Walker Christian Author, David N. Walker Historical Fiction Author, Fancy, Fancy Series, friends, Heaven Sent, Life, Life experience, Life lessons, Life truths, Life values, Party, People, Personal development, Self-help, Smashwords. Bookmark the permalink. Tremendous! Congratulations! Stopping by from Susie’s party. Happy Halloween! Thanks, Angelia. Same to you. Congratulations! This is a great announcement! Thanks for stopping by the party with this David! Have fun clicking on links and “mingling” with the guests. Tell them, “Susie sent me,” and they should click back here! This is good news, David. 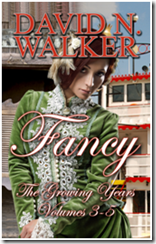 Though I bought each novella separately (except for the one or two you gave me), I really enjoyed Fancy. Thanks, sis. Don’t keep it a secret from your friends and family. Smart and savvy business move, David. I hope sales are good for you. And, thank you for the cake. Thanks, Patricia. Hope all’s well with you, too. Great news! Everybody enjoys saving a buck. 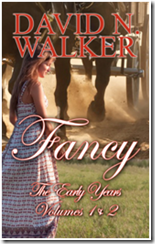 Fancy is a wonderful story about a remarkable lady. I’m already eager for your next novel Ruth. Thanks, honey. Working on it.